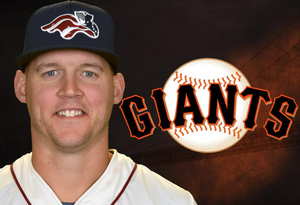 (Bridgewater, N.J., June 3, 2017) - The Somerset Patriots have announced that outfielder Jerry Sands’ contract has been purchased by the San Francisco Giants organization. Over 39 games with the Patriots this season, Sands hit .319 with a league-leading 13 home runs and a league-leading 45 RBI. He also led the league in runs (32), doubles (14), extra-base hits (27), total bases (99), SLG (.688) and OPS (1.075). Additionally, his .319 average ranks seventh in the Atlantic League. Sands leaves Somerset currently riding a 23-game on-base streak, including a 10-game hit streak (5/9 – 5/17) and back-to-back multi-homer games (5/30 – 5/31). Sands was in his first season with the Somerset Patriots and first in the Atlantic League. He has spent parts of the last three seasons in the big leagues and owns five years of service at the Major League level. The Middletown, New York native broke into the Majors with the Los Angeles Dodgers in 2011, where he hit .253 with four home runs and 26 RBI over 61 games. Sands made it back to the big league with the Dodgers in 2012 and the Tampa Bay Rays in 2014 before appearing in 50 games with the Cleveland Indians in 2015. That season, he hit .236 with four home runs and 19 RBI over 50 games. Sands is the seventh Somerset Patriot to have his contract purchased by a Major League organization this season. Left-handed pitchers Jeremy Bleich and Logan Darnell both went to the Los Angeles Dodgers, right-handed pitchers Tyler Cloyd and Ryan Kelly joined the Seattle Mariners, southpaw Aaron Laffey went to the Arizona Diamondbacks and righty Vin Mazzaro joined the Cincinnati Reds. All six were assigned to Triple-A.